US authorities have loosened some flight restrictions on 20 F-35s that make up the test aircraft fleet that were placed earlier this month, allowing pilots to fly faster and take tighter curves. Other restrictions remain, however, including borescope inspections of the front fan section of each F135 engine every three hours. The 79 remaining F-35s are still under the full restrictions. 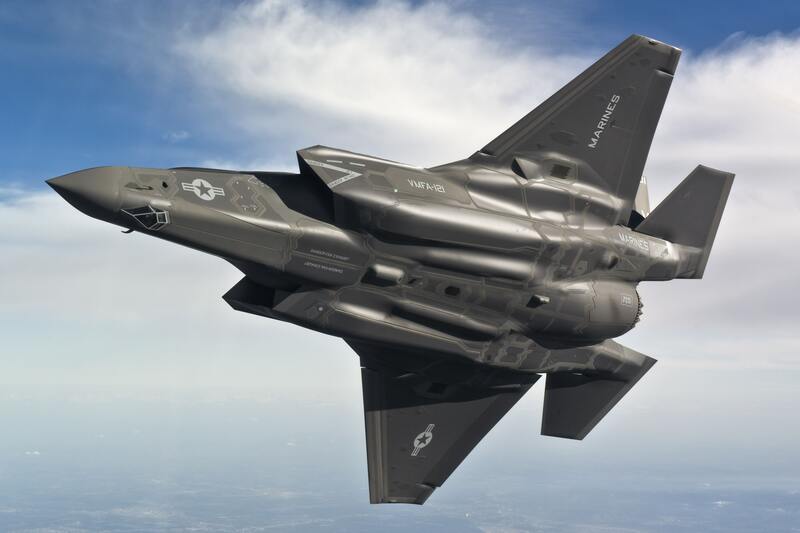 The restrictions due to a fire in June that damaged an F-35A and led to the Pentagon grounding the fleet for a time while the cause of the problem was discovered. In July, the Pentagon allowed the plane to begin flying again within limited parameters. As the restrictions are starting to be lifted, testing will now see pilots fly at speeds of up to 1.6 Mach, up from 0.9 Mach, and carry out turns with a gravitational load of 3.2 Gs, up from 3 Gs according to a US defence official on Tuesday. This news comes as the F-35B, the jump-jet variant, completes wet runway and crosswind testing spread over 37 missions with a duration of 41 days, using aircraft BF-4. “This testing is absolutely critical to 2B flight software fleet release and the Marine Corps. Collectively, the results support clearing the 20 knot crosswind envelope for conventional take off & landings, short take offs, and short landings, with ideal handling quality ratings and meaningful improvement over legacy 4th generational fighter aircraft.” says J.D. McFarlan, Lockheed Martin’s vice president for F-35 Test & Verification. The flight restrictions being loosened should allow F-35 test pilots and trainers to carry out additional tests but it still remains unclear how much of an impact the grounding and restrictions will have on the program’s flight test schedule for the year. US airworthiness officials are still requiring inspections of the Pratt & Whitney engines that power the jet every three hours, but that requirement and other restrictions may be revised as the investigation winds down, the official said.